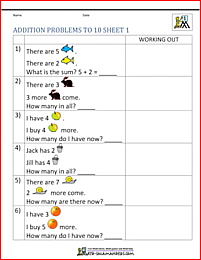 Welcome to our Addition Worksheets page. Here you will find a wide range of free printable Addition sheets and resources which will help your child improve their addition fact knowledge and column addition skills. We also have a range of addition word problems, addition puzzles and addition games to print and play! Addition is a process which children learn quite naturally as soon as they learn to start counting. During kindergarten and first grade, adding piles of objects together is really important and reinforces childrens understanding of place value and 1:1 correspondence. Later on, when children are confident adding piles of objects together, they can progress on to number lines or counting on in their heads. When children have understood this, they can begin to learn their addition facts and progress on to column addition. At 4th and 5th grade level, they start adding decimals. Knowing your addition facts is still a key skill that children need to be able to use in real life math - you may not always have a pencil and paper to hand to do your column addition, but you will always have your addition facts! 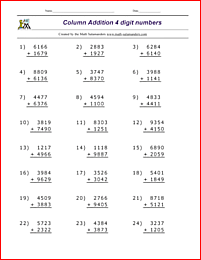 On this page you will find link to our range of addition math worksheets. Here you will find our selection of free resources such as flashcards and 100 squares to help your child to count and learn their addition facts. Here you will find a selection of printable Addition Flashcards designed to help your child learn their addition facts. Using flashcards is a great way to learn your addition facts. They can be taken on a journey, played with in a game, or used in a spare five minutes daily until your child knows their addition facts off by heart. These charts will support your child with their adding and subtracting, as well as their counting skills. Here you will find a selection of Mental Addition sheets designed to help your child improve their recall of Addition Facts. These addition worksheets start off with adding numbers to 10, progressing on to adding to 20 then up to 100 at third grade level. When children reach 4th grade, they start learning to add decimals and money amounts using column addition. 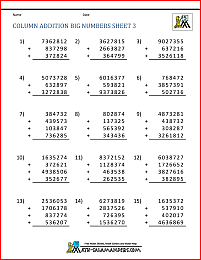 The addition sheets below will support your child with their addition learning. 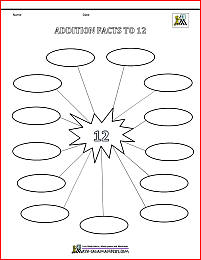 Here is our free generator for addition worksheets. This easy-to-use generator will create randomly generated addition worksheets for you to use. addition with numbers to 1 with 2 decimal places. 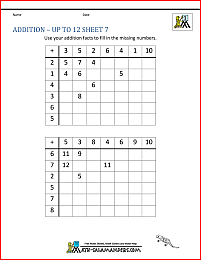 These generated sheets can be used in a number of ways to help your child with their addition fact learning. 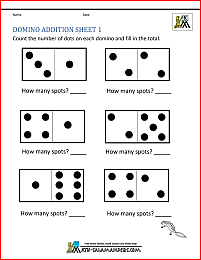 Here you will find a selection of Addition sheets designed to help your child improve their adding up to a total of 10.
add numbers up to a total of 10. 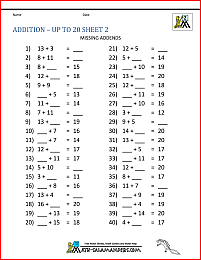 The worksheets on this page support the practice and learning of addition facts of numbers up to 12. Each sheet involves writing down all the possible pairs of numbers that make a given total. 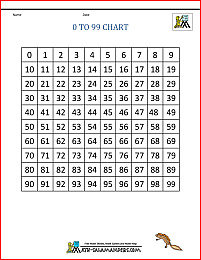 The following sheet will help your child learn to add with multiples of 10 up to 100. They have been carefully graded so you can select the right sheet for your child. Here you will find a range of Free Printable First Grade Addition Sheets designed to help you child to learn their Addition facts to 12+12. learn how to solve addition sums where one of the addends is missing, but the total is given. All the free Math Worksheets in this section are informed by the Elementary Math Benchmarks for Grade 1. Here you will find a range of Free Printable 2nd Grade Addition Sheets designed to help you child to learn their Addition facts to 20+20. All the free Math sheets in this section are informed by the Elementary Math Benchmarks for Second Grade. Here you will find a range of 3rd Grade free printable Addition Worksheets. The following sheets develop children's knowledge of practicing their Addition facts up to 100+100. 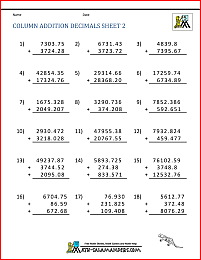 Here you will find a range of 5th Grade free printable Decimal Addition Worksheets. The following sheets develop children's understanding of place value and decimals as well as applying their addition fact knowledge of to work out their decimal addition facts. solve an addition sum where the answer is given but one of the addends is missing. All the free Addition sheets in this section are informed by the Elementary Math Benchmarks for Fifth Grade. Column Addition starts properly once children reach 1st grade, and after they have a good understanding of counting and place value. At first grade, children learn to add numbers up to 100 together. Once they have mastered this, they can progress on to adding a range of 3 digit, then 4 digit numbers together in columns. Once they reach 4th and 5th grade, they learn to add together columns of numbers which include decimals up to 2 decimal places. Here you will find a range of 1st Grade Column Addition sheets which are designed to help your child master their column addition. understand how to do column addition. Here you will find a range of 2nd Grade Column Addition sheets which are designed to help your child master their column addition. add numbers up to 1000 in columns. Here you will find a range of 3rd Grade Column Addition sheets which are designed to help your child master their column addition. add numbers up to 10,000 in columns. 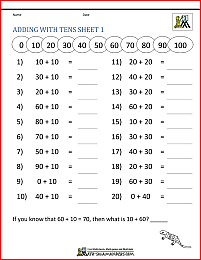 Here you will find a range of 4th Grade Column Addition sheets which are designed to help your child master their column addition. 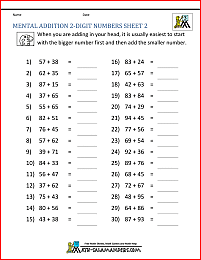 Here you will find a range of 5th Grade Column Addition sheets which are designed to help your child master their column addition with BIG numbers. Here you will find a range of Column Addition sheets which are designed to help your child master their column addition with decimals. add together columns of different money amounts. Here are some of our addition word problem worksheets. Here you will find a range of Free Printable Addition Games. The following games develop the Math skill of adding in a fun and motivating way. develop their strategic thinking skills.